We got a new push mower. Dave researched and researched online and finally ordered the Fiskars model. I figured they’d be good because of the scissors. It arrived just when we got back from lunch with T—, and she was staying for a cup of tea, so we couldn’t immediately open the box and put it together. T— is Dave’s ex-wife. Dave said it wasn’t until we were at First Slice, sitting at the table, that he remembered that they used to be married. Not that he had forgotten, just that the specific connection didn’t enter his head. I wondered if she felt more like general family, something like a cousin, but he said it wasn’t that. She just seems so right in her present life, and of course to me Dave does too, so while they are clearly very connected and seem to care about each other very much, it doesn’t seem to be fraught, or post-anything. It’s weird, meeting the exes of your current love. I can’t imagine the same person being attracted to both of us. T— is a force of nature. She’s an amazing singer of about the hardest music you can imagine someone singing. She wears coordinated jewelry. Multi-surfaced, arty jewely. And smart shoes, with heels. And hair that’s cut on a definite angle, no shilly-shallying. There’s no trace of apology in her, not even when she tells the waitress to leave her used tea bag and bring her some more hot water. She’s everything my hypnotist included in the custom-designed affirmation I repeated 25 times a day back when when I was coming out of my dead dad depression. Powerful and confident and safe. Everything definite, from her career to her style. She has the clarity of confidence. Or maybe it’s the confidence of clarity. 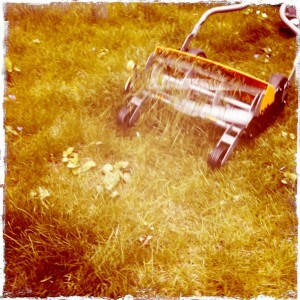 The Fiskars mower is not cute like old-fashioned Craftsman mowers. It’s cute like a pair of Fiskars scissors, if you consider those cute. Gray and orange, and shaped for efficiency. Later in the afternoon, T— headed on her way, and we put off work for a few more hours to try it out. We should have been working, we felt guilty about not working, but we were drawn irresistibly to the Amazon box. Dave put the mower together and took it for a spin. It was a miracle of manual lawn trimming! Direct and efficient, and it makes the most beautiful sound as it glides through the grass. I love the sound the rotating blades make on manual mowers. 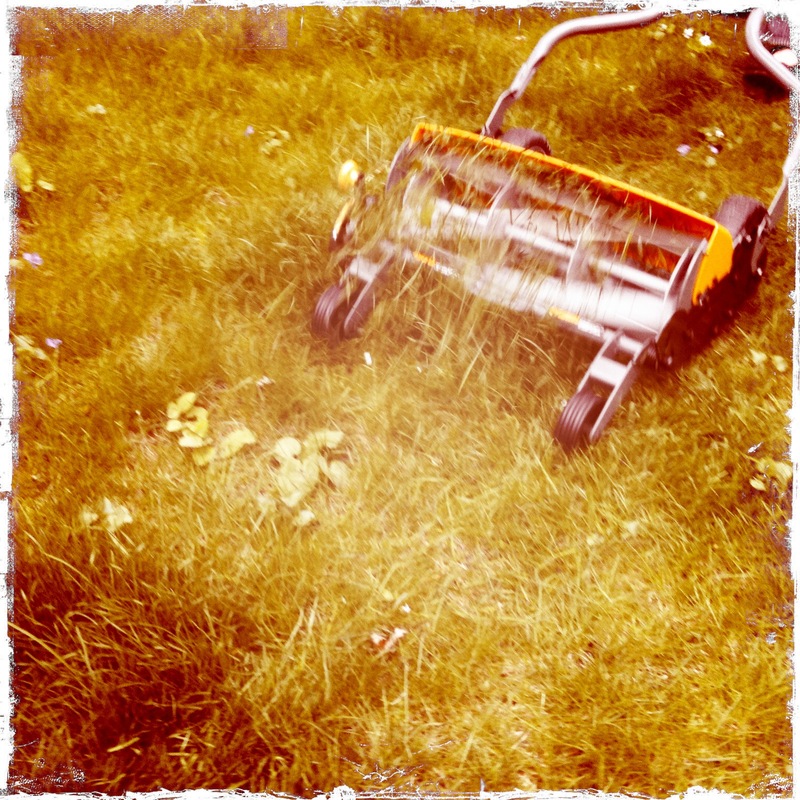 Happy mowing. With all this rain you’ll probably be doing it more than you’d like to in no time.